I have had a server with OVH for the past several years, and one of the things that took me many months of research, as well as trial and error, to get right was my IP address configuration for virtual machines. The documentation available from OVH has been consistently lacking these past few years on how to properly configure it. Debian \ Ubuntu systems will add to the complications, because they do not agree with the necessary configuration. If you try to add it traditionally, just by editing /etc/network/interfaces, you will most likely end up with no default gateway when you’re all said and done, and your connection still won’t work. For the first few months I was with OVH, I was launching my networking through a shell script in a cron job, because configuring it with /etc/network/interfaces just didn’t seem possible. 1. A dedicated server on the OVH network. This guide has been tested in the Roubaix datacenter, Gravelines datacenter, and the BHS datacenter. 2. A virtualization platform installed, and a virtual switch bridged with your network interface. I have been using VMWare, and a vSwitch bridged with my eth0 interface. This guide should be applicable to any virtualization suite (Xen, OpenVZ, etc) as long as your networking is bridged. 3. A Debian \ Ubuntu VM. 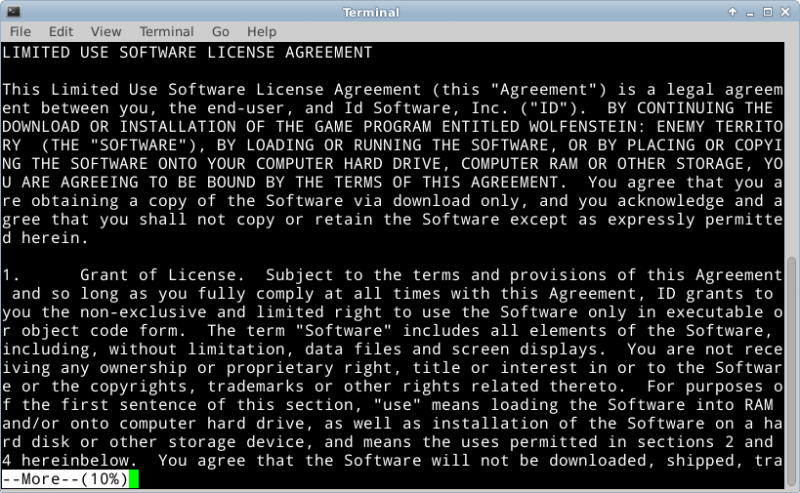 You can apply the knowledge gained from this guide to other operating systems (eg. CentOS) but the configuration will be different as the files are located in different places and are parsed differently. 4. A purchased IP range. You can purchase IP addresses from OVH in your Manager Panel. 1. Your dedicated server’s Main IP will be needed for this guide. Say, for example, your main IP is 123.4.5.67. 2. Your dedicated server’s Gateway IP will be needed for this guide. On the OVH network, this is the first three octets of your main IP, ending in 254. For 123.4.5.67, the gateway is 123.4.5.254. 3. A Fail Over IP Range registered with OVH. You can register any size IP block, and you can pick any IP from the block. Say for example, you bought 5.6.77.8/29. All of the Fail Over IPs are usable at OVH, so you have available all 8 IPs from 5.6.77.8 to 5.6.77.15 for use for your VMs. You can purchase an IP block from your Manager Panel. 4. A Registered VM MAC Address associated on OVH’s routers. Without this step, your connection will not work. You can register VM MACs in your Manager Panel. In the new OVH Manager panel, you can register a VM MAC address by going to the “Manage IPs” page, clicking the gear icon next to the IP(s) you want to assign to the VM, and clicking “Add A Virtual MAC”. You can choose an existing MAC address if you are assigning more than 1 IP, otherwise OVH will assign a new MAC address to you, and you will edit your VM preferences so your network interface has this MAC address. Make sure you select the MAC address type “VMWare” if you are using a VMWare server, as this will generate MAC addresses which VMWare will accept. You can use type “OVH” for any other virtualization platform. The “name of virtual machine” field is just for your notes, and can be anything. Install Debian \ Ubuntu to the VM, from a full install media. Do not plan on doing a network install, as this guide does not cover how to make the OVH networking functional during installation; only after installation. Skip the step for setting up networking during the installer, leave it unconfigured. Now that you have your operating system installed, you are ready to configure your /etc/network/interfaces file. This guide assumes that eth0 is your Internet interface. I will use IP addresses from the example above under “Gather Your Information”. Do not use these addresses, substitute your own IP addresses. You should choose 1 IP address from your IP block. If you want to add more, see the further instructions below. This IP is the Main IP of your VM. Regardless of the size of your block, you will treat the IP address as a /32 with a netmask 255.255.255.255. Because you are using a /32, the network\broadcast IP is your IP. Your default gateway should be the same as your dedicated server’s default gateway. DO NOT try to use what should logically be the gateway IP for your IP block, and DO NOT try to set your dedicated server itself as the gateway. The IP block is irrelevant, the gateway is always the dedicated server’s gateway IP. The routes have to be added this way, because the configuration is not valid. The gateway should not be reachable from this network range, because it’s a /32. However, the gateway will be reachable anyway, and adding the routes this way should work. Want To Add More IPs? Sometimes it is desirable to have more than one IP address on your server. You can easily add additional IPs from any IP block as an alias IP. You don’t need to configure any additional gateways, because the gateway is always your dedicated server gateway. You can purchase as many IP blocks as you want, and assign them all this way, it doesn’t matter if they are totally different IP ranges. In the example below, I will add 2 additional IPs from the IP range I used as an example, 5.6.77.8/29. First, reboot the VM to ensure that all of the networking changes you made are fully applied. Can you ping your default gateway? If not, did your route persist? Run “route -n” and see if the route is there. If it isn’t there, try adding it manually by running the commands in the post-up in /etc/network/interfaces. See if you get any errors. Did you configure DNS? Try pinging just an IP address, (eg. ping 4.2.2.1) and see if you get any response. Did you remember to register a MAC address, and did you change the MAC address for the VM? Run “ifconfig eth0” and make sure the MAC address shown matches what’s registered in your OVH Manager Panel. As always, feel free to leave a comment below if you need any assistance. I will be happy to help! 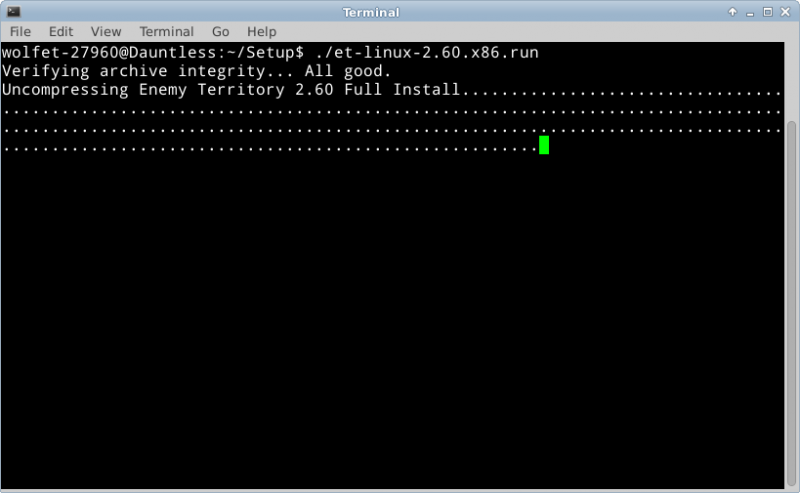 This guide will help you get up and running with HP’s command line Array Configuration Utility (ACU) on Ubuntu. This guide may will be especially useful if you have an HP Proliant server, or an HP P400 \ P410 RAID card or similar. HP Array Configuration Utility Is Now Installed! I may do some subsequent write-ups on the HP Array Configuration Utility. Please feel free to ask questions in the comments section, but please keep in mind that I’m still learning to use this tool as well. New to the HP Array Configuration Utility? Me too, so I did some Googling and found an awesome cheat sheet. I don’t want to steal any credit from its original authors, but I do think it should be reposted for archival. I’d like a copy of it for my own reference, so I decided to toss it here on Binary Impulse so others might stumble across it. Wolfenstein Enemy Territory is a free-to-play multiplayer game, based on World War II “Allies vs. Axis” style combat. It is a first-person shooter game, but it has objective-based gameplay. Players will perform tasks such as escorting tanks, stealing gold, repairing radio transmitters and delivering stolen documents to the transmitter, building tank barriers, dynamiting protection walls, and other objectives based on the map. The objective-based gameplay makes Enemy Territory a uniquely fun gaming experience, with the classic FPS aspects gamers crave. Enemy Territory is not one of those games where you look at your kill statistics, you’re too busy defending your objective or advancing on your enemy! At the end of this how-to, you should have a vanilla Enemy Territory running. You will be able to install Enemy Territory on a Windows client, connect to the server, and play Enemy Territory online! 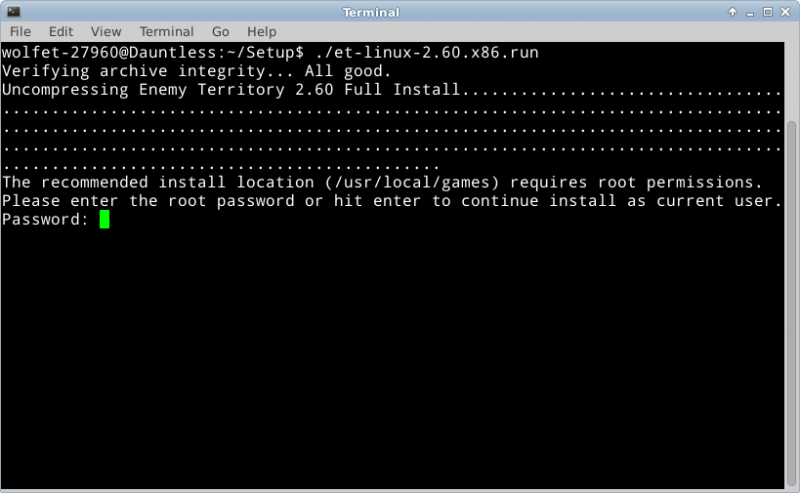 First, we need to download the Linux Enemy Territory game files. It is necessary to install the entire game in order to have a dedicated server, but no GUI is needed, you can do all of this through an SSH session if you choose. You can obtain Wolfenstein Enemy Territory on various websites on the Internet, but for the purposes of longevity of the links in this how-to, I will use the files hosted on The United Federation of Gaming (as I have control over these files). It is okay to continue as a limited user, and install the game in your home folder. 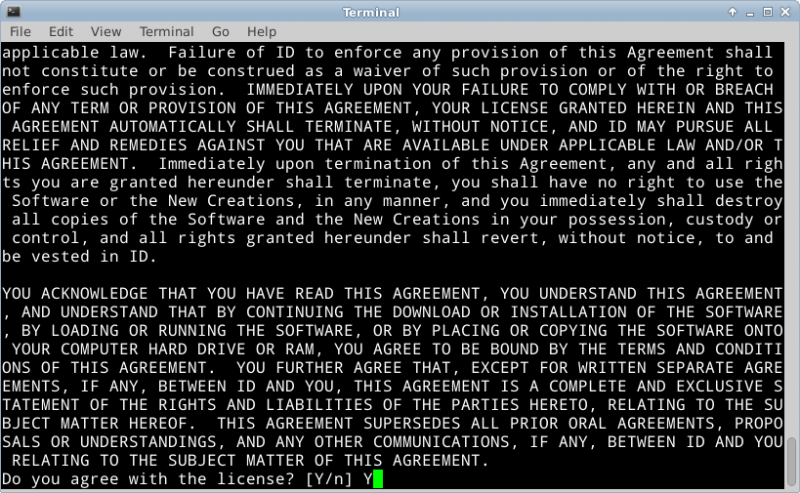 Press the Space Bar to quickly scroll through the license agreement. 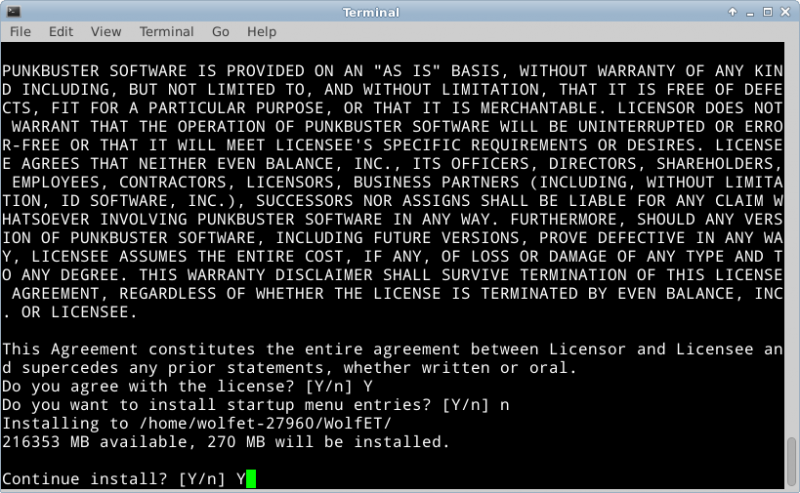 Type “Y” and hit Enter to accept the license agreement. Press “n” and hit Enter to avoid reading the CHANGES file. Type in a path to install the game to. I recommend installing into your home folder, unless you have a good reason not to. I installed to my home folder, in a folder called WolfET. When prompted about where to put the symbolic links. Symbolic links are basically just shortcuts, so this question is very non-important. I put them in my home folder, in a folder called WolfETLinks. If you get an error message like “No write permission to /path/to/symlink/folder” make sure the directory exists by using the mkdir command to create it. 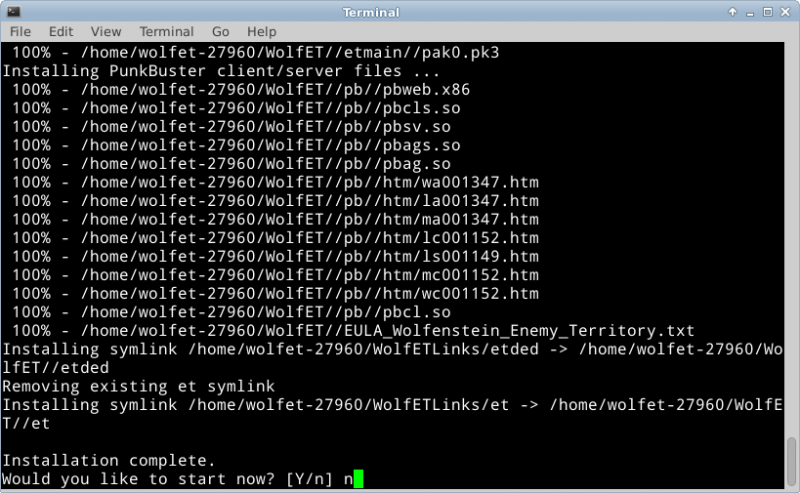 When asked about installing the PunkBuster client/server files, type “Y” and hit enter. 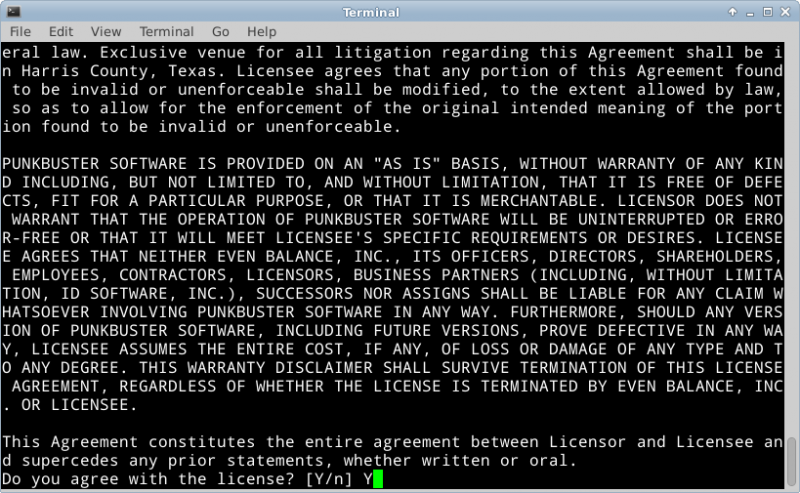 Again, use the Space Bar to scroll through the license agreement. Press “Y” and hit Enter to accept it. We do not want to install the startup menu entries, so press “n” and hit enter. Press “Y” and hit Enter to continue the installation. When the installation is completed, do not start the game now. Press “n” and hit Enter. 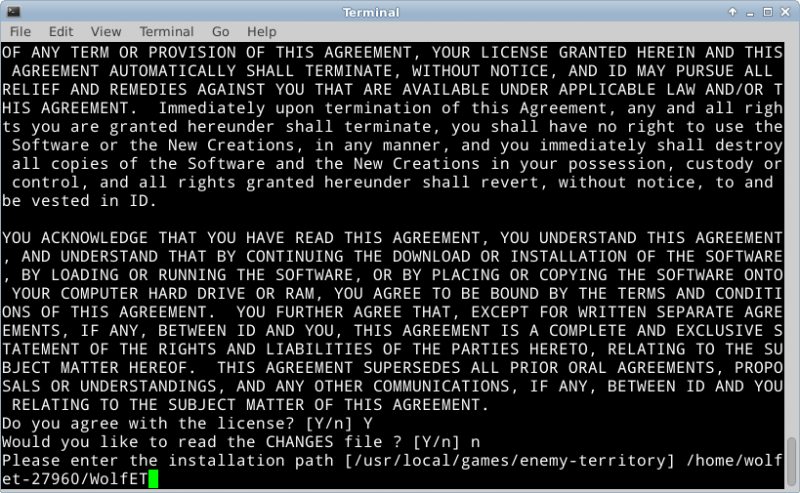 Copy the two files to the path where you installed Enemy Territory. This will overwrite the old game files with the patched ones. The Enemy Territory server is configured by two files primarily: server.cfg and a map rotation cfg of your choice. You can find these files in the etmain folder. The vanilla configuration will mostly work for your vanilla server, but there are a few notable settings you might want to change. set sv_maxclients allows you to set the number of slots available to your server. The default is 20 players. set g_password sets a join password on the server. Most servers will want to leave this blank, and doing so is not a security risk. set rconpassword sets a remote console password for the server. You can use this to control the server from the ~ menu in-game. set refereePassword sets a password to gain “referee” access in game, to change maps and handle basic functions from the GUI. set sv_maxRate and set sv_dl_maxRate are speed limits. I usually set them to 9999999999, to provide the best allowable performance to users. set sv_hostname sets the name of your server on the Internet lobby. set server_motd[0-5] sets the Message of The Day (MOTD) for the server. This is shown during initial connection. Usually people write server rules or other info here. For ease of configuration, the rest of server.cfg can be left vanilla until you see a need to tweak it. An entire post could be written about this file, but these are the basics of what most people will need to change. What I have done in the past, is copy campaigncycle.cfg to a file called servercycle.cfg and do my configuration in there. For now, we can use campaigncycle.cfg as is the default. It is possible to make your own custom campaign rotations, but that’s a post for another day. com_hunkmegs is a reference to the amount of memory you will let the server consume. I have found that increasing this limit is desirable when running a heavily loaded or modded server. The rest of that should be fairly self explanatory. Replace 192.168.10.5 with your server’s IP address. Replace servercycle.cfg with the map rotation configuration file you made above. If you renamed server.cfg, change that here as well. Run the launcher to start your game server. ET 2.60b linux-i386 May 8 2006 ----- FS_Startup ----- Current search path: /home/wolfet-27960/.etwolf/etmain /home/wolfet-27960/WolfET/etmain/pak2.pk3 (22 files) /home/wolfet-27960/WolfET/etmain/pak1.pk3 (10 files) /home/wolfet-27960/WolfET/etmain/pak0.pk3 (3725 files) /home/wolfet-27960/WolfET/etmain/mp_bin.pk3 (6 files) /home/wolfet-27960/WolfET/etmain ---------------------- 3763 files in pk3 files execing default.cfg couldn't exec language.cfg couldn't exec autoexec.cfg Hunk_Clear: reset the hunk ok Bypassing CD checks Found high quality video and fast CPU --- Common Initialization Complete --- Opening IP socket: 192.168.10.5:27960 Hostname: dauntless.epecweb.com Alias: localhost Alias: Dauntless IP: 127.0.0.1 Started tty console (use +set ttycon 0 to disable) execing servercycle.cfg ------ Server Initialization ------ Server: oasis Hunk_Clear: reset the hunk ok ----- FS_Startup ----- Current search path: /home/wolfet-27960/.etwolf/etmain /home/wolfet-27960/WolfET/etmain/pak2.pk3 (22 files) /home/wolfet-27960/WolfET/etmain/pak1.pk3 (10 files) /home/wolfet-27960/WolfET/etmain/pak0.pk3 (3725 files) /home/wolfet-27960/WolfET/etmain/mp_bin.pk3 (6 files) /home/wolfet-27960/WolfET/etmain ---------------------- 7526 files in pk3 files Sys_LoadDll(/home/wolfet-27960/.etwolf/etmain/qagame.mp.i386.so)... Sys_LoadDll(/home/wolfet-27960/.etwolf/etmain/qagame.mp.i386.so) failed: "/home/wolfet-27960/.etwolf/etmain/qagame.mp.i386.so: cannot open shared object file: No such file or directory" Sys_LoadDll(/home/wolfet-27960/WolfET/etmain/qagame.mp.i386.so)... ok Sys_LoadDll(qagame) found **vmMain** at 0xd2d3ab90 Sys_LoadDll(qagame) succeeded! ------- Game Initialization ------- gamename: etmain gamedate: Mar 10 2005 Not logging to disk. Gametype changed, clearing session data. Enable spawning! "/home/wolfet-27960/.etwolf/etmain/qagame.mp.i386.so: cannot open shared object file: No such file or directory"
Gametype changed, clearing session data. broadcast: print "Server: g_balancedteams changed to 1\n"
^1Warning: setstate called and no entities found is another OK error. It just means there is no one in the server right now. If your dedicated server is behind a firewall (and I certainly hope it is) you will need to forward a port to allow Enemy Territory traffic. That port is 27960 by default. Congratulations, if you’ve followed this guide, you now have a functional Enemy Territory server! To play, connect to your server’s IP address or find the game on the Internet lobby. If you have any questions about anything in this guide, or Enemy Territory server administration in general, please feel free to ask in the comments. I am not, by any means, an expert on Enemy Territory servers, but I’ve run one for a number of years and I know more about them than the average person, so go ahead and ask questions! Thanks for reading.